laura doodles: Inspiration Post: PIZZA PIZZA! Happy Halloween everyone!! Just because it's a Holiday doesn't mean I'm not going to post October's edition of "What Inspires Laura." The time I take out each month to compile a list of group of things that inspire me in hopes to inspire YOU as well! This month's theme is "PIZZA PIZZA." Mmmmm! Pizza!! The tasty treat that in the states is literally just a phone call away from arriving at your door piping hot and covered in whatever toppings you fancy! Pizza was always a treat at my household and it still remains my brother's favorite food. Try not to get hungry as you scroll down!! 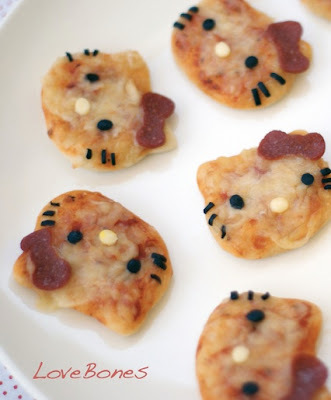 Let's start things out with an actual photograph of some pizza; Hello Kitty pizza that is!! I love Hello Kitty so why not? I bet these took a long time to make. And any little girl (or even big girl) would light up if they found these in her lunchbox for lunch! The pepperoni bows are just too cute! I found this photo on Flickr by user LoveBones! Time to move onto something less edible. 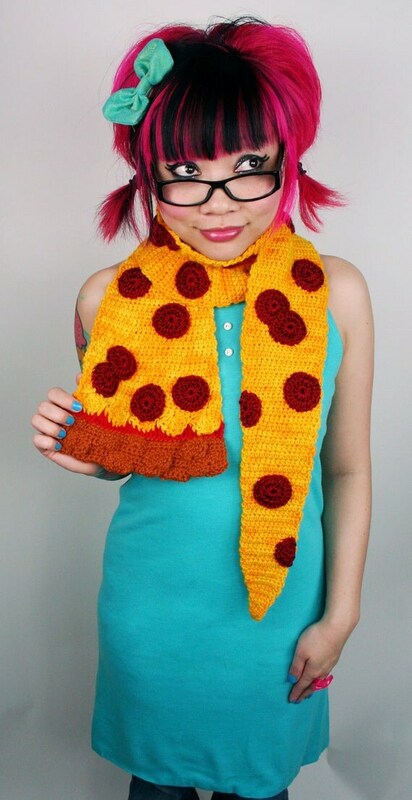 A pizza-themed scarf?? Yes, by TwinkieChan and if her name (or photo) doesn't seem familliar to you, I highly suggest you check out her Etsy store or her website. She creates all sorts of crazy crochet creations and is solely responsible for this yummy looking scarf for boys or girls! Not only would I totally rock this scarf it's so creative and unconventional it makes my imagination do backflips! From pizza scarves to building blocks!! I was never good at playing with LEGOs it was more something appealed to my brother's creativity but I am really digging this promo pizza set for New York Comic Con this year!! 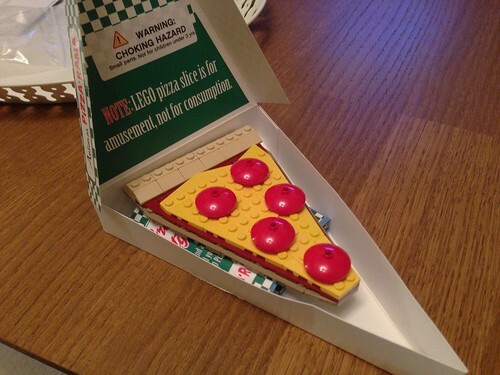 Bravo to the people at LEGO for thinking up this blocky little slice in it's own matching authentic pizza carry out box!! For more photos and details of this set be sure to check out the Toys N Brick's blog!! Pizza is round so where's a perfect place for it to wind up at? On a ring of course! I have to hand it to Catrina'sToybox on making this very realistic looking ring. It makes me want to go out, buy some polymer clay and get to work on making my own itty bitty pieces of food! You can only buy this ring on Etsy so be sure to check out her shop with lots of other Polymer Clay listings! And that is all I have for this month!! 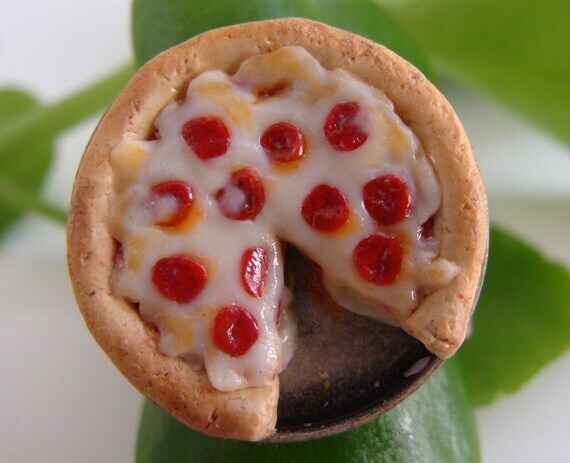 Hope you didn't drool too much over these different approaches of the always appetizing PIZZA! I've showed you pizza on a ring, on a scarf and even made of building blocks! Where will you we see pizza next?? That's up to you!! Hope everyone has a GREAT week and stay tuned for next month's inspiration post! What about your pizza Marie Antoinette? That would've been perfect for this blog entry! Out and About won an AWARD! Chocolate Chip Cookie Thank You! !